Systems and methods for using pressure swing adsorption to separate and/or capture resulting emissions are provided. A stream of recycled exhaust gas is passed into a first swing adsorption reactor comprising a first adsorbent material which adsorbs CO2. An enriched N2 stream is recovered from a forward end of the first swing adsorption reactor. The pressure in the first swing adsorption reactor is reduced. The first swing adsorption reactor is purged with a portion of the first N2 stream recovered from the first swing adsorption reactor. The first purge output is passed to a second swing adsorption reactor comprising a second adsorbent material which adsorbs CO2. A second N2 stream is recovered from the second swing adsorption reactor. The pressure in the second swing adsorption reactor is reduced. The second swing adsorption reactor is purged with a steam purge. The present application generally relates to low emission power production with separation and/or capture of resulting emissions. Capture of gases emitted from power plants is an area of increasing interest. Power plants based on the combustion of petroleum products generate carbon dioxide as a by-product. Historically this carbon dioxide has been released into the atmosphere after combustion. However, it is becoming increasingly desirable to capture the carbon dioxide generated by power plants and put it to alternative uses. Indeed, the demand for simultaneous power and natural gas, hydrocarbons and valuable industrial chemicals for consumer products is becoming increasingly insatiable. For example, existing natural and industrial sources of inert gases cannot meet the growing worldwide demand, especially of CO2 and N2, for Enhanced Oil Recovery (EOR) and Enhanced Gas Recovery (EGR). Simultaneously it is becoming imperative to capture and sequester greenhouse gases such as CO2 from power generation plants. The invention described herein enables the simultaneous economic production of multiple products to meet the demands described above, i.e., CO2, N2 and electric power production and hydrocarbons. These products can be generated by the integration of adsorption (PSA) separations processes with an advanced power generation system and hydrocarbon reservoirs. One example of such an advanced generation system is the advanced combined cycle turbine system, known as ULET (Ultra Low Emissions Turbine). Combined cycle power plants provide an efficient way to generate electricity from the burning of petroleum products or other carbon-based fuels. Combined cycle power plants can leverage an initial combustion reaction to power multiple turbines for generation of electricity, leading to more efficient power generation. However, conventional methods for capturing CO2 and N2 tend to reduce the efficiency of electricity generation, due to the additional energy required. U.S. Published Patent Application No. 2013/0333391 describes methods for capturing CO2 emissions utilizing single-stage pressure swing adsorption. That application teaches passing a portion of recycled exhaust gas into a swing adsorption reactor with an adsorbent material, recovering an N2 stream from a forward end of the reactor, reducing the pressure in the swing adsorption reactor, and purging the swing adsorption reactor with a steam purge to generate a CO2 recovery stream. Other potentially relevant publications can include: U.S. Patent Application Publication No. 20120318533, European Patent Application No. EP 2220338, an article by Reijers et al, Ind. Eng. Chem. Res., 2009, 48, 6966, and an article by Wright et al, Energy Procedia, 2011, 4, 1457, inter alia. Each of the foregoing references is hereby incorporated by reference. Certain embodiments of the present invention are directed to methods for capturing emissions comprising: passing a stream of recycled exhaust gas into a first swing adsorption reactor comprising a first adsorbent material; adsorbing CO2 on the first adsorbent material; recovering a first N2 stream from a forward end of the first swing adsorption reactor; reducing the pressure in the first swing adsorption reactor by outputting a blow down stream from at least one end of the first swing adsorption reactor; purging the first swing adsorption reactor with a portion of the first N2 stream recovered from the first swing adsorption reactor to create a first purge output from the first swing adsorption reactor; passing the first purge output to a second swing adsorption reactor comprising a second adsorbent material; adsorbing CO2 on the second adsorbent material; recovering a second N2 stream from a forward end of the second swing adsorption reactor; reducing the pressure in the second swing adsorption reactor by outputting a blow down stream from at least one end of the second swing adsorption reactor; and purging the second swing adsorption reactor with a steam purge to create an output from the second swing adsorption reactor. Additional embodiments are directed to systems for capturing emissions comprising: a first swing adsorption reactor which receives a stream of recycled exhaust gas, wherein the first swing adsorption reactor comprises: a first adsorbent material which adsorbs CO2; a first forward end from which a first N2 stream is output; a first blow down output feed which outputs a blow down stream to reduce the pressure in the first swing adsorption reactor; a first purge input feed which receives a portion of the first N2 stream; a first purge output feed which outputs a first purge output comprising CO2 and N2; a second swing adsorption reactor which receives the first purge output, wherein the second swing adsorption reactor comprises: a second adsorbent material which adsorbs CO2; a second forward end from which a second N2 stream is output; a second blow down output feed which outputs a blow down stream to reduce the pressure in the second swing adsorption; a second purge input feed which receives a steam purge; and a second purge output feed which outputs a second purge output comprising CO2 and steam. FIG. 8 shows pictorially shows the cycle setup of a 4-bed sorptive arrangement without interconnection between beds; and  FIG. 9 shows pictorially shows the cycle setup of a 4-bed sorptive arrangement with some level of interconnection between beds. In various aspects, systems and methods are provided for power generation using turbines while reducing and/or mitigating emissions during power generation. In a combined cycle generation system, the flue gas from a combustion reaction for a gas turbine can also be used to power a steam turbine. The flue gas can then be recycled for use as part of the input to the gas turbine. A portion of the recycled exhaust gas can be effectively separated to generate a high purity carbon dioxide stream, while reducing and/or minimizing the energy required for the separation, and without needing to reduce the temperature of the flue gas. This can allow another (e.g., the remaining) portion of the recycled exhaust gas, which can typically be composed of a majority of nitrogen, to be used to generate additional electricity, e.g., without having to adjust the pressure and/or temperature of the recycled exhaust gas to accommodate the conditions required for the carbon dioxide separation process. Thus, improved energy recovery can be realized from the combined cycle system, while also generating relatively high purity streams of carbon dioxide and nitrogen. A variety of system configuration and processing conditions can contribute to power generation with low emissions that can also be effectively separated and/or captured for further use. For example, the input gas flow for the combustor to the gas turbine can be selected to have a desirable composition, e.g., a roughly stoichiometric ratio of fuel to oxygen. Having a roughly stoichiometric ratio of fuel to oxygen can reduce the amount of unreacted oxygen present in the gas output after combustion. This can facilitate separation of the other combustion products, as well as potentially reducing/eliminating the production of NOx species. More generally, a roughly stoichiometric combustion reaction with a desirable feed can result in an exhaust primarily composed of CO2, N2, and H2O. Another example of a system configuration and/or process condition that can contribute to power generation with low emission that can be effectively separated and/or captured can include using recycled exhaust gas as part of the input gas flow. The gas flow exiting the combustion process can advantageously be used to power a gas turbine. After powering the gas turbine, this gas flow corresponds to an exhaust gas. This exhaust gas can be used in a combined cycle configuration power a steam turbine by using a heat exchanger to extract heat from the exhaust gas. This exhaust gas can then be recycled, after removal of water, for use as part of the input gas flow. The exhaust gas can advantageously have an elevated volume percentage of CO2 relative to ambient air, which can also assist in selecting the CO2 content of the input gas flow to the combustion reaction. Controlling the amount of CO2 in the combustion products can be beneficial for enhancing the energy output captured from the combustion reaction. Recycling all of the exhaust gas can allow for all of the carbon in the exhaust to be maintained in a single stream until the stream can be diverted to a carbon capture process. Typically, though, less than all of the recycled exhaust gas may be needed to provide additional gas for the input gas flow to combustion. As a result, any excess exhaust gas can be diverted, e.g., for separation into high purity CO2 and N2 gas streams. A convenient location in the process to perform this diversion can be after the recycled exhaust gas has been modified to achieve the temperature and pressure desired for the input gas flow to combustion. At this point, it can be desirable to perform the separation of CO2 and N2 while reducing/minimizing the amount of energy lost due to temperature/pressure reductions. For example, typical solvent methods for separating CO2 and N2 require a reduction in the temperature of the recycled exhaust gas. For such conventional solvent methods, in order to preserve as much energy in the N2 stream as possible, heat exchangers can be used to transfer heat from the recycled exhaust gas to the separated N2 stream. In some aspects, the separation of CO2 and N2 can be performed by using a pressure swing adsorption (PSA) process to separate the CO2 and N2 at the temperature and pressure of the input gas flow to the combustion reaction. Using PSA to perform the separation can allow for recovery, for example, of at least about 60% (such as at least about 65%>, at least about 70%, at least about 75%, at least about 80%>, at least about 85%>, at least about 90%, at least about 95%, at least about 97%, at least about 98%, at least about 99%, at least about 99.3%, or at least about 99.5%o) of the C02 in the recycled exhaust gas, e.g., while also generating an N2 stream with at least about 90% purity (such as at least about 93% purity, at least about 95% purity, at least about 97%) purity, at least about 98% purity, or at least about 99% purity) and/or a C02 stream with at least about 80% purity (such as at least about 85% purity, at least about 90% purity, at least about 95%) purity, at least about 97% purity, at least about 98% purity, at least about 99% purity, at least about 99.3% purity, or at least about 99.5% purity). In various aspects, the operating conditions for a PSA reactor can be selected to facilitate the power generation process while still effectively capturing the exhaust gases. Using a relatively high temperature PSA can preserve the energy content of the N2 portion of the recycled exhaust gas, so that the N2 gas stream can be used to power an additional turbine for electricity generation. By contrast, a conventional separation method for CO2 separation such as solvent separation can typically require adjustment of the temperature and/or pressure of the stream to facilitate the separation. Thus, instead of requiring energy to modify the recycled exhaust prior to treating the exhaust gases, use of a PSA reactor can allow the capture process to be adjusted to match the operating conditions for power generation. The high temperature PSA can also be performed using a process cycle avoiding the need for high temperature steam and/or another energy intensive purge gas. This can allow high purity CO2 to be recovered while reducing/minimizing the amount of energy lost to capture of the exhaust gases. In various aspects, systems and methods are provided for controlling and/or capturing the emissions produced during power generation. One goal of power generation is to use input feeds (such as fuels) as efficiently as possible, so that power generation can be increased/optimized for a given amount of fuel and/or of equipment. Based on the conditions for effective power generation, a goal for control/capture of emissions can be to provide effective capture of emissions while reducing/minimizing the changes to the conditions for power generation. As used herein, the term "stoichiometric combustion" refers to a combustion reaction having a volume of reactants comprising a fuel and an oxidizer and a volume of products formed by combusting the reactants, where substantially the entire volume of the reactants is used to form the products. As used herein, the term "substantially stoichiometric combustion" refers to a combustion reaction having a molar ratio of combustion fuel to oxygen ranging from plus to minus about 10%, e.g., from about plus to minus about 5%, of the oxygen required for a stoichiometric ratio. For example, the stoichiometric ratio of fuel to oxygen for methane is 1 :2 (CH4 + 2Ο2 → CO2 + 2H2O), whereas propane should have a stoichiometric ratio of fuel to oxygen of 1 :5. Another way of measuring substantially stoichiometric combustion can be as a ratio of oxygen supplied to oxygen required for stoichiometric combustion, e.g., from about 0.9: 1 to about 1.1 : 1 or from about 0.95 : 1 to about 1.05 : 1. In some aspects, the processes described herein can be used to produce ultra low emission electric power as well as CO2 and N2 for enhanced oil recovery (EOR), enhanced gas recovery (EGR), and/or sequestration/capture applications; in such cases, the process conditions for EOR/EGR may be similar to sequestration/capture application or may be slightly different. In one or more aspects, a mixture of oxygen-enriched gas (e.g., enriched air) and fuel can be stoichiometrically or substantially stoichiometrically combusted and simultaneously mixed with a stream of recycled exhaust gas. The stream of recycled exhaust gas, generally including products of combustion such as CO2, can be used as a diluent to control, adjust, and/or otherwise moderate the temperature of combustion and the exhaust that enters the succeeding expander. As a result of using oxygen enrichment, the recycled exhaust gas can have an increased CO2 content, thereby allowing the expander to operate at even higher expansion ratios for the same inlet and discharge temperatures, thereby producing significantly increased power. Combustion in commercial gas turbines at stoichiometric conditions or substantially stoichiometric conditions (e.g., "slightly rich" combustion) can prove advantageous to eliminate the cost of excess oxygen removal. By cooling the exhaust and condensing the water out of the cooled exhaust stream, a relatively high content CO2 exhaust stream can be produced. While a portion of the recycled exhaust gas can be utilized for temperature moderation in a closed Brayton cycle, a remaining purge stream can be used for EOR and/or EGR applications and/or electric power can be produced with little or no sulfur oxides (SOx), nitrogen oxides (NOx), and/or CO2 being emitted to the atmosphere. In some aspects, performing stoichiometric combustion can allow for generation of an exhaust stream consisting substantially of C02, H2O, and N2. An exhaust stream consisting substantially of CO2, H2O, and N2 is defined as an exhaust stream that contains about 5 mol% or less of other gas molecules, e.g., about 2.5 mol% or less or about 1 mol% or less. FIG. 1 depicts a schematic of an illustrative integrated system 100 for power generation and CO2 recovery using a combined-cycle arrangement, according to one or more embodiments. In at least one embodiment, the power generation system 100 can include a gas turbine system 102 characterized as a power-producing, closed Brayton cycle. The gas turbine system 102 can have a first or main compressor 104 coupled to an expander 106 via a shaft 108. The shaft 108 can be any mechanical, electrical, and/or other power coupling, thereby allowing a portion of the mechanical energy generated by the expander 106 to drive the main compressor 104. In at least one embodiment, the gas turbine system 102 can be a standard gas turbine, where the main compressor 104 and expander 106 form the compressor and expander ends, respectively. In other embodiments, however, the main compressor 104 and expander 106 can be individualized components in the system 102. The gas turbine system 102 can also include a combustion chamber 110 configured to combust a fuel introduced via line 112 mixed with an oxidant introduced via line 114. In one or more embodiments, the fuel in line 112 can include any suitable hydrocarbon gas or liquid, such as natural gas, methane, ethane, naphtha, butane, propane, syngas, diesel, kerosene, aviation fuel, coal derived fuel, bio-fuel, oxygenated hydrocarbon feedstock, or any combinations thereof. The oxidant via line 114 can be derived from a second or inlet compressor 118 fluidly coupled to the combustion chamber 110 and adapted to compress a feed oxidant introduced via line 120. In one or more embodiments, the feed oxidant in line 120 can include atmospheric air, enriched air, or combinations thereof. When the oxidant in line 114 includes a mixture of atmospheric air and enriched air, the enriched air can be compressed by the inlet compressor 118 before and/or after being mixed with the atmospheric air. The enriched air can have an overall oxygen concentration of at least about 30 vol%, e.g., at least about 35 vol%, at least about 40 vol%, at least about 45 vol%, at least about 50 vol%, from about 30 vol% to about 70 vol%, from about 30 vol% to about 65 vol%, from about 30 vol% to about 60 vol%, from about 30 vol% to about 55 vol%, from about 30 vol% to about 50 vol%, from about 35 vol% to about 70 vol%, from about 35 vol% to about 65 vol%, from about 35 vol% to about 60 vol%, from about 35 vol% to about 55 vol%, from about 35 vol% to about 50 vol%, from about 40 vol% to about 70 vol%, from about 40 vol% to about 65 vol%, from about 40 vol% to about 60 vol%, from about 40 vol% to about 55 vol%, from about 40 vol% to about 50 vol%, from about 45 vol% to about 70 vol%, from about 45 vol% to about 65 vol%, from about 45 vol% to about 60 vol%, from about 45 vol% to about 55 vol%, from about 45 vol% to about 50 vol%, from about 50 vol% to about 70 vol%, from about 50 vol% to about 65 vol%, or from about 50 vol% to about 60 vol%. The enriched air can be derived from any one or more of several sources, including implementing various technologies upstream of the inlet compressor 118 to produce the enriched air. For example, the enriched air can be derived from such separation technologies as membrane separation, PSA, temperature swing adsorption, nitrogen plant-byproduct streams, and/or combinations thereof. The enriched air can additionally or alternately be derived from an air separation unit (ASU), such as a cryogenic ASU, for producing nitrogen for pressure maintenance or other purposes. The reject stream from the ASU can be rich in oxygen, e.g., having an overall oxygen content from about 50 vol% to about 70 vol%. This reject stream can be used as at least a portion of the enriched air and subsequently diluted, if needed, with unprocessed atmospheric air to obtain the desired oxygen concentration for the application. An exhaust gas in line 116 directed to the inlet of the expander 106 can be generated as a product of combustion of the fuel in line 112 and the compressed oxidant in line 114, in the presence of the compressed recycle exhaust gas in line 144. In at least one embodiment, the fuel in line 112 can be primarily natural gas, thereby generating a discharge or exhaust gas via line 116 that can include volumetric portions of vaporized water, CO2, nitrogen, nitrogen oxides (NOx), and sulfur oxides (SOx). In some embodiments, a small portion of unburned fuel in line 112 or other compounds can also be present in the exhaust gas in line 116 due to combustion equilibrium limitations. As the exhaust gas in line 116 expands through the expander 106, it can generate mechanical power to drive the main compressor 104, an electrical generator, and/or other facilities, and can also produce a gaseous exhaust in line 122 having a heightened CO2 content resulting from the influx of the compressed recycle exhaust gas in line 144. In some implementations, the expander 106 may be adapted to produce additional mechanical power that may be used for other purposes. Additionally or alternately, the power generation system 100 can include an exhaust gas recirculation (EGR) system 124, which can include a heat recovery steam generator (HRSG) 126, or similar device, fluidly coupled to a steam gas turbine 128. In at least one embodiment, the combination of the HRSG 126 and the steam gas turbine 128 can be characterized as a power-producing closed Rankine cycle. In combination with the gas turbine system 102, the HRSG 126 and the steam gas turbine 128 can form part of a combined-cycle power generating plant, such as a natural gas combined-cycle (NGCC) plant. The gaseous exhaust in line 122 can be introduced to the HRSG 126 in order to generate steam via line 130 and a cooled exhaust gas in line 132. Additionally or alternately, the steam in line 130 can be sent to the steam gas turbine 128 to generate additional electrical power. The cooled exhaust gas in line 132 can be sent to a first cooling unit 134 adapted to cool the cooled exhaust gas in line 132 and generate a cooled recycle gas stream 140. The first cooling unit 134 can include, for example, one or more contact coolers, trim coolers, evaporative cooling unit, or any combination thereof. The first cooling unit 134 can additionally or alternately be adapted to remove a portion of any condensed water from the cooled exhaust gas in line 132 via a water dropout stream 138. In at least one embodiment, the water dropout stream 138 may be routed to the HRSG 126 via line 141 to provide a water source for the generation of additional steam in line 130 therein. Additionally or alternately, the water recovered via the water dropout stream 138 can be used for other downstream applications, such as supplementary heat exchanging processes. In most embodiments, the cooled recycle gas stream 140 can be directed to a boost compressor 142. Cooling the cooled exhaust gas in line 132 in the first cooling unit 134 can reduce the power required to compress the cooled recycle gas stream 140 in the boost compressor 142. As opposed to a conventional fan or blower system, the boost compressor 142 can be configured to compress, and thus increase, the overall density of the cooled recycle gas stream 140, thereby directing a pressurized recycle gas in line 145 downstream, where the pressurized recycle gas in line 145 can thus exhibit an increased mass flow rate for the same volumetric flow. This can prove advantageous, since the main compressor 104 can be volume-flow limited, and directing more mass flow through the main compressor 104 can result in higher discharge pressures, thereby translating into higher pressure ratios across the expander 106. Higher pressure ratios generated across the expander 106 can allow for higher inlet temperatures and, therefore, an increase in expander 106 power and/or efficiency. As can be appreciated, this may prove advantageous, since the CC -rich exhaust gas in line 116 can generally maintain a higher specific heat capacity. Since the suction pressure of the main compressor 104 can typically be a function of its suction temperature, a cooler suction temperature can generally demand less power to operate the main compressor 104 for the same mass flow. Consequently, the pressurized recycle gas in line 145 can optionally be directed to a second cooling unit 136, e.g., which can include one or more direct contact coolers, trim coolers, evaporative cooling units, or any combination thereof. In at least one embodiment, the second cooling unit 136 can serve as an aftercooler adapted to remove at least a portion of the heat of compression generated by the boost compressor 142 on the pressurized recycle gas in line 145. The second cooling unit 136 can additionally or alternately extract additional condensed water via a water dropout stream 143. In some such embodiments, the water dropout streams 138,143 can converge into stream 141 and may or may not be routed to the HRSG 126 to generate additional steam via line 130 therein. While only first and second cooling units 134,136 are depicted herein, any desired number of cooling units can be employed to suit a variety of applications, without departing from the scope of the disclosure. In many embodiments, a purge stream 146 can be recovered from the compressed recycle exhaust gas in line 144 and subsequently treated in a CO2 separator 148 to capture CO2 at an elevated pressure via line 150. Preferably, the CO2 separator can be a PSA unit, as described in further detail below. The separated CO2 in line 150 can be used for sales, used in other processes requiring CO2, and/or further compressed and injected into a terrestrial reservoir for enhanced oil recovery (EOR), enhanced hydrocarbon recovery (EHR), sequestration, or another purpose. Because of the stoichiometric or substantially stoichiometric combustion of the fuel in line 112 combined with a boosted pressure from the boost compressor 142, the CO2 partial pressure in the purge stream 146 can be much higher than in conventional gas turbine exhausts. A residual stream 151, essentially depleted of CO2 and consisting primarily of nitrogen, can additionally or alternately be derived from the CO2 separator 148. In some embodiments, the residual stream 151 can be introduced to a gas expander 152 to provide power and an expanded depressurized gas, or exhaust gas, via line 156. The expander 152 can be, for example, a power-producing nitrogen expander. As depicted, the gas expander 152 can be optionally coupled to the inlet compressor 118 through a common shaft 154 or other mechanical, electrical, or other power coupling, thereby allowing a portion of the power generated by the gas expander 152 to drive the inlet compressor 118. However, during startup of the system 100 and/or during normal operation, when the gas expander 152 is unable to supply all the required power to operate the inlet compressor 118, at least one motor 158, such as an electric motor, can be used synergistically with the gas expander 152. For instance, the motor 158 can be sensibly sized such that, during normal operation of the system 100, the motor 158 can be configured to supply the power short-fall from the gas expander 152. In other embodiments, however, the gas expander 152 can be used to provide power to other applications, and not directly coupled to the inlet compressor 118. For example, there may be a substantial mismatch between the power generated by the expander 152 and the requirements of the compressor 118. In such cases, the expander 152 could be adapted to drive a smaller (or larger) compressor (not shown) that may demand less (or more) power. An expanded depressurized gas in line 156, primarily consisting of dry nitrogen gas, can be discharged from the gas expander 152. In at least one embodiment, the combination of the gas expander 152, inlet compressor 118, and CO2 separator 148 can be characterized as an open Brayton cycle, and/or a third power-producing component of the power generation system 100. Conventional systems and methods of expanding the nitrogen gas in the residual stream 151, and variations thereof, are believed to be known in the art and are thus not discussed herein. Additionally or alternately, gas expander 152 can be replaced and/or complemented with a downstream compressor 158. At least a portion (and up to all) of the residual stream 151 can be compressed in a downstream compressor to generate a compressed exhaust gas via line 160, which can be suitable for injection into a reservoir for pressure maintenance applications. In applications where methane gas is typically reinjected into hydrocarbon wells to maintain well pressures, compressing the residual stream 151 may prove advantageous. For example, the pressurized nitrogen gas in line 160 can instead be injected into the hydrocarbon wells, and any residual methane gas can be sold or otherwise used as fuel in related applications, such as in line 112. By using enriched air as the compressed oxidant in line 114 and pressurizing the exhaust gas in the boost compressor 142, the power generation system 100 can achieve higher concentrations of CO2 in the exhaust gas, thereby allowing for more effective CO2 separation and capture. Embodiments disclosed herein, for example, can effectively increase the concentration of CO2 in the exhaust gas in line 116 to CO2 concentrations ranging from about 10 vol% to about 20 vol%. To achieve such CO2 concentrations, the combustion chamber 110 can be adapted to stoichiometrically or substantially stoichiometrically combust an incoming mixture of fuel in line 112 and compressed oxidant in line 114, where the compressed oxidant in line 114 can include a stream having an oxygen content greater than about 21 vol%, e.g., enriched air, such as having an overall oxygen concentration of about 30 vol%, about 35 vol%, about 40 vol%, about 45 vol%, or about 50 vol%. In order to moderate the temperature of the stoichiometric combustion and meet expander 106 inlet temperature and component cooling requirements, a portion of the exhaust gas with increased CO2 content derived from the compressed recycle exhaust gas in line 144 can be injected into the combustion chamber 110 as a diluent. Thus, embodiments of the disclosure can essentially eliminate excess oxygen from the exhaust gas in line 116, while advantageously increasing its CO2 concentration, e.g., up to about 20 vol% or optionally higher. As such, the gaseous exhaust in line 122 can have less than about 3.0 vol% oxygen, for example less than about 1.0 vol% oxygen, less than about 0.1 vol% oxygen, or less than about 0.01 vol% oxygen. At least one benefit of having an increased CO2 concentration can be that the expander 106 can be operated at an even higher expansion ratio for the same inlet and discharge temperatures, and can thereby produce increased power. This can be due to the higher heat capacity of CO2 relative to nitrogen found in ambient air. In one or more aspects, the expansion ratio of the expander 106 can be increased from about 17.0 to about 20.0, corresponding to about 10 vol% and about 20 vol% CO2 recycle streams, respectively. For example, enriched air having about 35 vol% oxygen can be used in order to achieve the about 20 vol% in the CO2 recycle stream. Additional or alternate benefits of having an increased CO2 concentration in the recycle gas can include, but are not limited to, an increased concentration of CO2 in the extracted purge stream 146 used for CO2 separation. Because of its increased CO2 concentration, the purge stream 146 need not be as large in order to extract the required amounts of CO2. For example, the equipment handling extraction for CO2 separation can be smaller, including its piping, heat exchangers, valves, absorber towers, etc. Moreover, increased concentrations of CO2 can improve the performance of CO2 removal technology, including using low-energy separation processes, such as employing less energy-intensive solvents that would otherwise be untenable. Consequently, capital expenditures for capturing CO2 can be dramatically lowered. An example of operation of the system 100 will now be discussed. As should be appreciated, specific temperatures and pressures achieved/experienced in the various components of any of the embodiments disclosed herein can change depending on, among other factors, the purity of the oxidant used and/or the specific makes and/or models of expanders, compressors, coolers, etc. Accordingly, it should be appreciated that the particular data described herein is for illustrative purposes only and should not be construed as the only interpretation thereof. In an embodiment, the inlet compressor 118 can provide compressed oxidant in line 114 at a pressure between about 280 psia (about 1.9 MPaa) and about 300 psia (about 2.1 MPaa). Also contemplated herein, however, is aeroderivative gas turbine technology, which can produce and consume pressures of up to about 750 psia (about 5.2 MPaa) and higher. The main compressor 104 can be configured to recycle and compress recycled exhaust gas into the compressed recycle exhaust gas in line 144 at a pressure nominally at or above the combustion chamber 110 pressure, and to use a portion of that recycled exhaust gas as a diluent in the combustion chamber 110. Because amounts of diluent needed in the combustion chamber 110 can depend on the purity of the oxidant used for stoichiometric combustion or the particular model/design of expander 106, a ring of thermocouples and/or oxygen sensors (not shown) can be disposed on the outlet of the expander 106. In operation, the thermocouples and/or sensors can be adapted to regulate and determine the volume of exhaust gas required as diluent needed to cool the products of combustion to the required expander inlet temperature, and also to provide feedback to regulate the amount of oxidant being injected into the combustion chamber 110. Thus, in response to the heat requirements detected by the thermocouples and/or the oxygen levels detected by the oxygen sensors, the volumetric mass flow of compressed recycle exhaust gas in line 144 and compressed oxidant in line 114 can be manipulated up or down to track the demand. In at least one embodiment, a pressure drop of about 12-13 psi (about 83-90 kPa) can be experienced across the combustion chamber 110 during stoichiometric or substantially stoichiometric combustion. Combustion of the fuel in line 112 and the compressed oxidant in line 114 can generate temperatures between about 2000°F (about 1093°C) and about 3000°F (about 1649°C) and pressures ranging from about 250 psia (about 1.7 MPaa) to about 300 psia (about 2.1 MPaa). As described above, because of the increased mass flow and higher specific heat capacity of the CC -rich exhaust gas derived from the compressed recycle exhaust gas in line 144, higher pressure ratios can be achieved across the expander 106, thereby allowing for higher inlet temperatures and increased expander 106 power. The gaseous exhaust in line 122 exiting the expander 106 can exhibit pressures at or near ambient, e.g., about 13-17 psia (about 90-120 kPaa). The temperature of the gaseous exhaust in line 122 can be from about 1225°F (about 663°C) to about 1275°F (about 691°C) before passing through the HRSG 126 to generate steam in line 130 and a cooled exhaust gas in line 132. In one or more embodiments, the cooling unit 134 can reduce the temperature of the cooled exhaust gas in line 132, thereby generating the cooled recycle gas stream 140 having a temperature between about 32°F (about 0°C) and about 120°F (about 49°C). As can be appreciated, such temperatures can fluctuate, e.g., depending on wet bulb temperatures during specific seasons in specific locations around the globe. According to one or more embodiments, the boost compressor 142 can be configured to elevate the pressure of the cooled recycle gas stream 140 to a pressure ranging from about 17 psia (about 120 kPaa) to about 21 psia (about 140 kPaa). As a result, the main compressor 104 can eventually receive and compress a recycled exhaust with a higher density and increased mass flow, thereby allowing for a substantially higher discharge pressure while maintaining the same or similar pressure ratio. In order to further increase the density and mass flow of the recycle exhaust gas, the pressurized recycle gas in line 145 discharged from the boost compressor 142 can then be further cooled in the optional second cooling unit 136, which can, in some embodiments, be configured to reduce the pressurized recycle gas temperature in line 145 to about 105°F (about 41°C) before being directed to the main compressor 104. Additionally or alternately, the temperature of the compressed recycle exhaust gas in line 144 discharged from the main compressor 104, and consequently the temperature of the purge stream 146, can be about 800°F (about 427°C), with a pressure of around 280 psia (about 1.9 MPaa). The addition of the boost compressor 142 and the stoichiometric combustion of enriched air can increase the CO2 purge pressure in the purge stream 146, which can lead to improved solvent treating performance in the CO2 separator 148 due to the higher CO2 partial pressure. PSA relies on swinging or cycling pressure over a bed of adsorbent through a range of values. In PSA processes, a gaseous mixture is conducted under pressure for a period of time over a first bed of a solid sorbent that is selective, or relatively selective, for one or more components, usually regarded as a contaminant, to be removed from the gaseous mixture. For example, a feed can be introduced into a PSA apparatus at a feed pressure. At the feed pressure, one or more of the components (gases) in the feed can be selectively (or relatively selectively) adsorbed, while one or more other components (gases) can pass through with lower or minimal adsorption. A component (gas) that is selectively adsorbed can be referred to as a "heavy" component of a feed, while a gas that is not selectively adsorbed can be referred to as a "light" component of a feed. For convenience, a reference to the "heavy" component of the feed can refer to all components (gases) that are selectively adsorbed, unless otherwise specified. Similarly, a reference to the "light" component can refer to all components (gases) that are not selectively adsorbed, unless otherwise specified. After a period of time, the feed flow into the PSA apparatus can be stopped. The feed flow can be stopped based on a predetermined schedule, based on detection of breakthrough of one or more heavy components, based on adsorption of the heavy component(s) corresponding to at least a threshold percentage of the total capacity of the adsorbent, or based on any other convenient criteria. The pressure in the reactor can then be reduced to a desorption pressure that can allow the selectively adsorbed component(s) (gas(es)) to be released from the adsorbent. Optionally, one or more purge gases can be used prior to, during, and/or after the reduction in pressure to facilitate release of the selectively adsorbed component(s) (gas(es)). Depending on its nature, a full PSA cycle can optionally be performed at a roughly constant temperature. As PSA is usually enabled by at least adsorption and usually occurs on gaseous components, the terms "adsorption"/" adsorbent" and "gas(es)" are used as descriptors in the instant specification and claims, without intending to be limiting in scope, even though "absorption"/"absorbent"/"sorbent"/"sorption" and "component(s)" may be more generally applicable. Multiple beds can be used to enable a complete cycle, where typically every bed sequentially goes through the same cycle. When a first bed satisfies a condition, such as the adsorbent in the reactor becoming sufficiently saturated, the feed flow can be switched to a second bed. The first bed can then be regenerated by having the adsorbed gases released. To allow for a continuous feed flow, a sufficient number of adsorbent beds can be used so that the first bed is finished regenerating prior to at least one other bed satisfying the condition for switching reactors. In various aspects, a PSA unit can be used for performing a separation on a stream containing CO2 and N2. An example of such a stream can include the exhaust stream from a combustion reaction for providing power for a gas turbine. Preferably, the exhaust stream can be the exhaust from a combustion reaction performed with a substantially stoichiometric composition with regard to the amount of oxygen and fuel. Prior to use as a feed for separation by PSA, the exhaust stream can undergo further processing, such as condensation to remove water, combustion to remove excess fuel, adsorption for removal of NOx species, and/or other types of processing to remove components different from CO2 and N2. In some aspects, the portion of the exhaust stream used as the feed for the PSA reactor can have a water content of less than about 1.0 vol%, such as less than about 0.5 vol%. Additionally or alternately, the portion of the exhaust stream used as the feed for the PSA unit can have an 02 content of less than about 3.0 vol%, such as less than about 1.0 vol% or less than about 0.5 vol%. Further additionally or alternately, the feed into the PSA unit can be substantially composed of CO2 and N2, where components of the input gas feed different from CO2 and N2 are present in an amount of about 1.0 vol% or less each, such as less than about 0.5 vol% each. Still further additionally or alternately, in a feed substantially composed of CO2 and N2, the combined vol% of components other than CO2 and N2 can be about 2.0 vol% or less, such as about 1.0 vol% or less or 0.5 vol% or less. To perform a separation, a portion of the recycled exhaust stream can be introduced into a PSA unit, such as a purge stream from the exhaust stream recycle loop. The portion of the recycled exhaust stream can be withdrawn from the exhaust recycle system at a location after the temperature and pressure of the recycled exhaust stream have been modified (and/or after desired temperature and pressure have been obtained) for use as part of the input gas flow to the combustion reaction. At such point in the recycle system, the exhaust stream can have a temperature from about 300°C to about 600°C, e.g., from about 300°C to about 550°C, from about 300°C to about 500°C, from about 300°C to about 450°C, from about 300°C to about 400°C, from about 350°C to about 600°C, from about 350°C to about 550°C, from about 350°C to about 500°C, from about 350°C to about 450°C, from about 400°C to about 600°C, from about 400°C to about 550°C, from about 400°C to about 500°C, from about 425°C to about 600°C, from about 425°C to about 550°C, from about 425°C to about 500°C, from about 425°C to about 460°C, from about 450°C to about 600°C, from about 450°C to about 550°C, from about 500°C to about 600°C. Additionally or alternately, the temperature can be at least about 325°C, e.g., at least about 350°C, at least about 400°C, at least about 425°C, or at least about 440°C. Further additionally or alternately, the temperature can be about 575°C or less, about 550°C or less, about 500°C or less, about 475°C or less, about 460°C or less, or about 440°C or less. Still further additionally or alternately, the pressure of the recycled exhaust stream can be at least about 10 bara (about 1.0 MPa), e.g., at least about 15 bara (about 1.5 MPa), at least about 20 bara (about 2.0 MPa), at least about 25 bara (about 2.5 MPa), or at least about 30 bara (about 3.0 MPa). Yet further additionally or alternately, the pressure can be about 60 bara (6.0 MPa) or less, e.g., about 50 bara (about 5.0 MPa) or less, about 40 bara (about 4.0 MPa) or less, about 35 bara (about 3.5 MPa) or less, about 30 bara (about 3.0 MPa) or less, about 25 bara (about 2.5 MPa) or less, or about 22.5 bara (about 2.25 MPa) or less. In some alternative aspects, other locations for withdrawing the portion of the recycled exhaust stream can be selected, so long as the withdrawn portion has similar temperature and pressure values. In some aspects, the recycled exhaust stream can be introduced into the PSA unit at a separation temperature and a separation pressure that can correspond to the temperature and pressure of the recycle stream. However, some variation in temperature and/or pressure may occur between withdrawal of the portion of the recycled exhaust stream from the recycle system and introduction of the recycled exhaust stream into the PSA unit. For example, the separation temperature for the portion of the recycled exhaust stream introduced into the PSA unit can differ from the temperature in the recycle system by about 20°C or less, e.g., by about 15°C or less or by about 10°C or less. It is noted that, although having the same temperature for the separation temperature and the temperature in the recycle stream (i.e., a difference of approximately 0°C) is included within the enumerated differences, in some rare embodiments the temperature differences can optionally exclude 0°C. Additionally or alternately, the separation pressure for the portion of the recycled exhaust stream introduced into the PSA unit can differ from the pressure in the recycle system by about 5 bar (0.5 MPa) or less, e.g., about 2 bara (0.2 MPa) or less, about 1 bara (about 0.1 MPa) or less, or about 0.5 bar (about 50 kPa) or less. When the exhaust stream is introduced into the PSA unit, the N2 in the exhaust stream corresponds to a "light" component while the CO2 corresponds to a "heavy" component. Thus, the N2 can primarily pass through the PSA unit while the CO2 can be selectively adsorbed. The adsorption of CO2 from the feed can result in a product N2 stream. The feed can be passed to one or more adsorbent beds until one or more pre-defined criteria is satisfied for switching the feed to other adsorbent beds or otherwise stopping the flow of feed gas. Any convenient pre-defined criteria can be used. For example, the feed can be passed through the unit for a specified time period. Additionally or alternately, the feed can be passed into the unit until a breakthrough amount of CO2 is detected in the product N2 stream. Further additionally or alternately, the feed can be passed into the unit until the amount of CO2 that has entered the unit is approximately equal to a threshold value of the adsorbent capacity of the unit. In such a situation, for example, the feed can be passed into the unit until the amount of CO2 that has entered the unit is equal to at least about 75% of the adsorbent capacity of the adsorbent material in the unit, such as at least about 80%), at least about 85%>, or at least about 90%. A typical PSA cycle using a single PSA reactor can involve introducing feed into the reactor for about 30 seconds to about 300 seconds, e.g., for about 60 seconds to about 120 seconds. The product N2 stream can have a purity of at least about 85 vol%>, e.g., at least about 88 vol%>, at least about 90 vol%>, at least about 92 vol%>, at least about 93 vol%>, at least about 94 vol%>, at least about 95 vol%>, at least about 96 vol%>, at least about 97 vol%>, or at least about 98 vol%>. After optional removal of water, the product N2 stream can have a purity of at least about 90 vol%>, e.g., at least about 95 vol%>, at least about 97 vol%>, at least about 98 vol%>, or at least 99 vol%>. The pressure of the N2 stream can be at least about 90%, e.g., at least about 95%, of the pressure of the recycled exhaust used as the input to the PSA unit. Additionally or alternately, the pressure of the N2 stream can differ from the separation pressure by less than about 0.5 bar (about 50 kPa), e.g., less than about 0.3 bar (about 30 kPa) or less than about 0.1 bar (about 10 kPa). Further additionally or alternately, the separation temperature for the portion of the recycled exhaust stream introduced into the PSA unit can differ from the temperature of the N2 product stream by about 20°C or less, e.g., by about 15°C or less or by about 10°C or less. It is noted that, although having the same temperature for the separation temperature and the temperature in the recycle stream (i.e., a difference of approximately 0°C) is included within the enumerated differences, in some rare embodiments the temperature differences can optionally exclude 0°C. Additionally or alternately, the temperature of the N2 product stream can be at least the temperature of the PSA unit (the adsorption temperature) during the adsorption portion of the separation cycle. When the feed to any reactor in the PSA unit is stopped, the pressure in that reactor can be reduced, e.g., using one or more blow down processes. In a blow down process, one or both sides of a reactor can be opened to allow pressure to release in the form of a blow down gas stream. The blow down gas stream can generally include a majority portion of N2 and can also typically include some CO2. The amount of adsorbed CO2 released in the blow down process(es) can depend on the nature of the adsorbent. In some conventional PSA reactors, the blow down gas stream can be exhausted from the feed input side of the reactor. Alternatively, one or more blow down gas streams can be exhausted from the product side of the reactor. For example, one option can include having an initial blow down process exiting from the product side of the reactor followed by a second blow down process allowing a gas stream to exit from both sides of the reactor. The blow down process(es) can reduce the pressure in the reactor to a value from about 0.9 bara (about 90 kPa) to about 3.0 bara (about 0.3 MPa), e.g., from about 1.0 bara (about 0.1 MPa) to about 3.0 bara (about 0.3 MPa), from about 1.1 bara (about 110 kPa) to about 3.0 bara (about 0.3 MPa), from about 1.3 bara (about 130 kPa) to about 3.0 bara (about 0.3 MPa), from about 0.9 bara (about 90 kPa) to about 2.6 bara (about 260 kPa), from about 1.0 bara (about 0.1 MPa) to about 2.6 bara (about 260 kPa), from about 1.1 bara (about 110 kPa) to about 2.6 bara (about 260 kPa), from about 1.3 bara (about 130 kPa) to about 2.6 bara (about 260 kPa), from about 0.9 bara (about 90 kPa) to about 2.0 bara (about 0.2 MPa), from about 1.0 bara (about 0.1 MPa) to about 2.0 bara (about 0.2 MPa), from about 1.1 bara (about 110 kPa) to about 2.0 bara (about 0.2 MPa), or from about 1.3 bara (about 130 kPa) to about 2.0 bara (about 0.2 MPa). In many embodiments, maintaining a pressure above atmospheric pressure in the reactor can assist with the adsorbent retaining CO2 until a subsequent purge step when desorption is desired. In some embodiments, the length of time for the blow down processes can be from about 30 seconds to about 120 seconds. In some aspects, the use of multiple blow down steps can be desirable for creating blow down streams that are easier to subsequently process. For example, during adsorption of CO2 from an exhaust gas, a profile can typically develop in a reactor, with a higher content of non-adsorbed CO2 near the back (input) end of the reactor and a lower content of CO2 near the exit (front) end of the reactor. Based on this profile, a partial blow down from only the exit (front) end of the reactor can be used to produce a blow down output with a low CO2 content. This initial blow down step can result in the higher CO2 content near the back (input) end of the reactor being distributed more evenly throughout the reactor. As this occurs, it can then be more efficient to allow blow down output streams to exit from both ends of the reactor until the desired lower pressure can be achieved. Preferably, a buffer gas is not introduced into a reactor during the time between stopping the flow of exhaust gas and starting the blow down process step(s). It can additionally or alternately be preferred that the blow down process step(s) can be performed without introducing an additional gas into the reactor. Avoiding the use of buffer gases and/or additional gases in the blow down steps can be desirable, because introduction of such gases after the flow of exhaust gas is stopped can typically result in further loss of value into a low value stream. For example, the output flows generated by the blow down step(s) are, by definition, lower pressure output flows relative to the product N2 flow generated during the separation of the exhaust gas. Thus, the N2 in the blow down output has typically lost much of its value from a power generation standpoint. Prior to further use, the N2 in the blow down output flow likely must be recompressed. Adding additional N2 after the flow of exhaust gas is stopped can typically only increase the amount of N2 in this low value output flow. The blow down output flow can preferably be relatively low in CO2, as it is generally desirable to retain as much CO2 as possible until the start of the subsequent purge step(s). Any CO2 that exits a PSA reactor as part of a blow down stream represents additional CO2 in a stream other than the desired CO2 product stream. This additional CO2, which can typically be in low concentration, can then need to be separately handled if it is desired to achieve as high an amount of carbon capture and recovery as possible. Thus, adding additional CO2 here is also not typically desirable. Finally, adding a third gas different from CO2, N2, or H2O may not be desirable, as introduction of such a gas can likely result in another component requiring separation. After the blow down process(es), one or more purge gas flows can be used to remove the adsorbed CO2 from a reactor. One option is to use a steam purge at a pressure from about 1.0 bara (about 0.1 MPa) to about 3.0 bara (about 0.3 MPa), e.g., from about 1.1 bara (about 110 kPa) to about 3.0 bara (about 0.3 MPa), from about 1.3 bara (about 130 kPa) to about 3.0 bara (about 0.3 MPa), from about 1.0 bara (about 0.1 MPa) to about 2.6 bara (about 260 kPa), from about 1.1 bara (about 110 kPa) to about 2.6 bara (about 260 kPa), from about 1.3 bara (about 130 kPa) to about 2.6 bara (about 260 kPa), from about 1.0 bara (about 0.1 MPa) to about 2.0 bara (about 0.2 MPa), from about 1.1 bara (about 110 kPa) to about 2.0 bara (about 0.2 MPa), or from about 1.3 bara (about 130 kPa) to about 2.0 bara (about 0.2 MPa), to assist in desorbing the CO2. An alternative option can include using a steam purge at a pressure above 3.0 bara (0.3 MPa), e.g., of at least 4.0 bara (0.4 MPa), of at least 5.0 bara (0.5 MPa), from above 3.0 bara (0.3 MPa) to about 20 bara (about 2 MPa), from above 3.0 bara (0.3 MPa) to about 15 bara (about 1.5 MPa), from above 3.0 bara (0.3 MPa) to about 10 bara (about 1 MPa), from above 3.0 bara (0.3 MPa) to about 8 bara (about 0.8 MPa), from above 3.0 bara (0.3 MPa) to about 6 bara (about 0.6 MPa), from above 3.0 bara (0.3 MPa) to about 5 bara (about 0.5 MPa), from 4.0 bara (0.4 MPa) to about 20 bara (about 2 MPa), from 4.0 bara (0.4 MPa) to about 15 bara (about 1.5 MPa), from 4.0 bara (0.4 MPa) to about 10 bara (about 1 MPa), from 4.0 bara (0.4 MPa) to about 8 bara (about 0.8 MPa), from 4.0 bara (0.4 MPa) to about 6 bara (about 0.6 MPa), from 4.0 bara (0.4 MPa) to about 5 bara (about 0.5 MPa), from 5.0 bara (0.5 MPa) to about 20 bara (about 2 MPa), from 5.0 bara (0.5 MPa) to about 15 bara (about 1.5 MPa), from 5.0 bara (0.5 MPa) to about 10 bara (about 1 MPa), from 5.0 bara (0.5 MPa) to about 8 bara (about 0.8 MPa), or from 5.0 bara (0.5 MPa) to about 6 bara (about 0.6 MPa). The steam purge can result in a product CO2 output stream that can also include H2O and a lesser amount of N2. Depending on the configuration of the PSA unit, a steam purge can last for about 25 seconds to about 60 seconds. After removal of water, the product CO2 stream can have a purity of at least about 60%, e.g., at least about 65%, at least about 70%, at least about 75%, at least about 80%, at least about 85 vol%, at least about 90 vol%, at least about 92 vol%, at least about 94 vol%, at least about 95 vol%, at least about 96%, at least about 97%, at least about 98%, at least about 99%, at least about 99.3%, or at least about 99.5%. Additionally or alternately, the amount of CO2 recovered can correspond to at least about 80 vol%, e.g., at least about 85 vol%, at least about 90 vol%, at least about 92 vol%, at least about 94 vol%, at least about 95 vol%, at least about 96%, at least about 97%, at least about 98%, at least about 99%, at least about 99.3%, or at least about 99.5%. The amount of steam used in the steam purge can correspond to about 1.0 moles of water or less per mole of CO2 in the feed, e.g., about 0.9 moles of water or less per mole of CO2 in the feed, about 0.75 moles of water or less per mole of CO2 in the feed, about 0.6 moles of water or less per mole of CO2 in the feed, about 0.5 moles of water or less per mole of CO2 in the feed, or about 0.4 moles of water or less per mole of CO2 in the feed. Using less steam in the purge can be beneficial, because the amount of steam used can typically correspond to the amount of energy used for the CO2 recovery. It is noted that the feed can typically contain at least 50 mol%, and often at least 75 mol%, of N2. Thus, a comparison of the number of moles of water per total moles of gas (including both N2 and CO2) in the feed could produce still lower values, e.g., about 0.5 moles of water or less per mole of gas in the feed, about 0.4 moles of water or less per mole of gas in the feed, about 0.3 moles of water or less per mole of gas in the feed, about 0.25 moles of water or less per mole of gas in the feed, about 0.2 moles of water or less per mole of gas in the feed, about 0.15 moles of water or less per mole of gas in the feed, or about 0.1 moles of water or less per mole of gas in the feed. In such embodiments where there is a nonzero amount of steam used in the steam purge, the molar ratio of steam can be at least about 0.05 moles of water or less per mole of CO2 in the feed (e.g., at least about 0.1 moles of water or less per mole of CO2 in the feed, at least about 0.2 moles of water or less per mole of CO2 in the feed, or at least about 0.3 moles of water or less per mole of CO2 in the feed) and/or can be at least about 0.01 moles of water or less per mole of gas in the feed (e.g., at least about 0.02 moles of water or less per mole of gas in the feed, at least about 0.05 moles of water or less per mole of gas in the feed, or at least about 0.1 moles of water or less per mole of gas in the feed). After the steam purge, a second nitrogen purge can optionally be used to remove water and any remaining CO2 from the reactor. If the second purge is not used, the N2 output stream in the next cycle may have higher water content, but otherwise the additional water is not believed to significantly impact the separation process. When a second nitrogen purge is used, it can be performed for about 10 seconds to about 45 seconds. After the steam purge and the optional second nitrogen purge, the reactor can then be repressurized to start the next separation cycle. The repressurization can be performed using the input feed (the recycled exhaust gas). Alternatively but preferably, a second purge, such as a second nitrogen purge, may not be performed, as such a second purge can represent a flow of buffer gas between the end of a purge step and the start of the next cycle of introducing exhaust gas for separation of N2 and CO2. For the reasons noted above, additional buffer gas steps can typically be undesirable, as such buffer steps can tend to result in additional volume for low value gas streams. Alternatively, no steam may intentionally be used as a purge gas in the desorption step of the PSA cycle. In such an alternative, if a purge gas is used at all, it would not intentionally include water but, for instance, could include a nitrogen purge (e.g., which can last for about 10 seconds to about 60 seconds, for about 10 seconds to about 50 seconds, for about 10 seconds to about 45 seconds, for about 15 seconds to about 60 seconds, for about 15 seconds to about 50 seconds, for about 15 seconds to about 45 seconds, for about 20 seconds to about 60 seconds, for about 20 seconds to about 50 seconds, for about 20 seconds to about 45 seconds, for about 25 seconds to about 60 seconds, for about 25 seconds to about 50 seconds, or for about 25 seconds to about 45 seconds). It should be understood that, even when no steam is intentionally added, some water/steam may nevertheless be present as an impurity/contaminant in any purge stream that is used. The use of no intentionally added steam can allow the CO2 from the PSA process to be introduced directly into CO2 compressors, e.g., for well injection in enhanced oil recovery processes, without the need for intermediate equipment such as condensers or heat exchangers. Beds of adsorbent can be arranged in any convenient manner to provide a flow path for gas, including axial and/or radial flow directions. The vessels holding the bed of adsorbent can be oriented with respect to flow direction in any convenient manner. One typical orientation for a PSA reactor can be to have a reactor where the direction of flow is aligned with the long or primary axis of the reactor. An example of this includes having PSA reactors in the form of vertical cylinders, where the input gas flow enters the cylinder through the top or bottom surface. While this can represent a conventional configuration for a PSA reactor relative to the direction of gas flow, scaling up a process to handle large flow volumes can pose difficulties. For example, a typical length to diameter ratio for a PSA reactor can be about 3 to 1, such as a reactor with a length of about 10 meters and a diameter of about 3 meters. Increasing the size of such a reactor can generally result in an increasing pressure drop across the reactor, which is typically not desirable. Thus, in order to scale up axial flow PSA reactors to handle large gas flows, multiple reactors can typically be used. Additionally or alternately, a PSA reactor can be used where the long or primary axis of the reactor can be perpendicular to the direction of gas flow. For example, a PSA reactor can include parallel plates of adsorbent with the long axis of the parallel plates being perpendicular to the direction of gas flow. This can allow a much larger volume of adsorbent for capturing CO2 to be placed in a single reactor with an axial flow orientation while reducing the distance the gas flow must travel to cross the reactor. As a result, this type of configuration can reduce the pressure drop across a PSA reactor while still handling large volumes of input gas flow. This can reduce the number of separate reactors required to handle a large flow. As an example, a horizontally oriented PSA reactor can have parallel plates of adsorbent of approximately rectangular shape, e.g., with a long axis of about 30 meters and a short axis of about 4 meters. In the horizontal configuration, the input gas can be introduced to flow across the short axis. This can be accomplished by introducing the input gas at several locations along a side of the reactor corresponding to the long axis. Flow distributors can then be used inside the PSA reactor so that the input gas can be distributed along the entire length of the long axis. For large gas flow rates, the pressure drop from distributing the feed across the long axis of a PSA reactor can be lower than attempting to force such a large gas flow rate through a plurality of conventional axial flow PSA reactors. Embodiments of the present invention employ a PSA unit employing two PSA reactors in stages. FIG. 2 schematically shows an example of such a PSA unit with two PSA reactors arranged in series. In the embodiment shown in FIG. 2, a stream of exhaust gas from a combustion process as described above, for example, is passed into a feed side of a first PSA reactor (PSA-1). PSA-1 includes at least one adsorbent bed which preferentially adsorbs CO2 in a stream comprising CO2 and N2. A stream of enriched N2 exits the forward end of PSA-1. When the amount of CO2 adsorbed in PSA-1 has reached a pre-defined level, which may be determined by using any of several pre-defined criteria mentioned herein above, the feed of exhaust gas to PSA-1 may be ceased and the pressure in PSA-1 subsequently reduced. The pressure is preferably reduced by outputting a blow down stream from PSA-1. Once the pressure is reduced to a value suitable to desorb CO2 from the adsorbent bed, a portion of the recovered N2 stream is redirected to PSA-1 to be used as a purge. Because only a portion of the recovered N2 stream from PSA-1 is redirected to be used as a purge, the resultant mixture of CO2 and N2 exiting PSA- 1 has a greater concentration of CO2 than does the stream of exhaust gas initially input into PSA- 1. As seen in FIG. 2, the resultant mixture of CO2 and N2 with a higher concentration of C02 released from PSA-1 is then passed to a second swing adsorption reactor (PSA-2). PSA-2 likewise includes at least one adsorbent bed which preferentially adsorbs CO2. A stream of N2 exits the forward end of PSA-2 where it may be passed to a compressor with 02. When the amount of CO2 adsorbed in PSA-2 has reached a pre-defined level, which may be determined by using any of several pre-defined criteria mentioned herein above, the feed from PSA-1 to PSA-2 may be ceased and the pressure in PSA-2 subsequently reduced. The pressure is preferably reduced by outputting a blow down stream from PSA-2. Once the pressure is reduced to a value suitable to desorb CO2 from the adsorbent bed, PSA-2 is purged with steam. A combination of primarily CO2 and steam is then produced from the forward end of PSA-2 where it may be passed to a condenser to isolate the CO2. An advantage of an embodiment in accordance with FIG. 2 is that by utilizing a portion of the enriched N2 stream released from PSA-1 as a purge for PSA-1, high-capacity adsorbent materials can be used in PSA-1. Ordinarily, PSA reactors comprise adsorbent materials that may not be sensitive to steam, i.e., the adsorption capabilities of the adsorbent materials may not deteriorate significantly with exposure to steam. These materials that are resistant to steam have a lower capacity for adsorbing CO2 than do other materials which are sensitive to steam. By purging PSA-1 with N2 gas as opposed to steam, steam-sensitive adsorbent materials with a higher capacity for adsorbing CO2 may be implemented in PSA-1. Preferably, only a portion of the enriched N2 stream released from PSA-1 is diverted to purge PSA-1 to avoid simply recombining the components of the exhaust gas. By purging with only a portion of the enriched N2 stream, a gas with a higher concentration of CO2 than the exhaust gas is released from PSA-1. FIG. 4 illustrates the advantage of using a high-capacity adsorbent in PSA-1. In FIG. 4, the relationship between CO2 adsorption and pressure for PSA-1 and PSA-2 are represented by isotherm curves. PSA-1, having a high-capacity adsorbent, has a steeper curve than does PSA-2. Accordingly, PSA-1 may adsorb more CO2 at a given pressure than does PSA-2. By adsorbing CO2 in PSA-1 at the initial exhaust gas feed pressure, subsequently reducing the pressure, and then purging PSA-1, the concentration of CO2 in the input to PSA-2 is increased. The increased concentration of CO2 of the feed passed to PSA-2 then allows PSA-2 to more effectively adsorb the CO2 than if the feed had a lower concentration of CO2. FIG. 5 further illustrates the advantage of using a two stage PSA process with an intermediate pressure drop between PSA-1 and PSA-2. The intermediate pressure is the pressure at which N2 and CO2 is purged from PSA-1 and subsequently fed into PSA-2, which is a value between the high pressure at which exhaust gas is fed to PSA-1 and the low pressure at which the CO2 and steam product is released from PSA-2. Simulation of a two stage PSA process in accordance with an embodiment described herein shows that CO2 recovery is maximized at a particular intermediate pressure and that steam usage is minimized for a second particular intermediate pressure. These two optimized intermediate pressures roughly coincide and produce more favorable values for CO2 recovery and steam usage than does a single stage PSA process. For example, in the graphs of FIG. 5, a two stage process with an intermediate pressure of 12 bar allows the recovery of roughly 20% more CO2 and uses roughly 10% less steam than does a single stage PSA process. This is a critical advantage because the expenditure of steam to recover CO2 is directly proportional to energy removed from the power generation system. A two stage PSA process in accordance with embodiments discussed herein may be operated at a variety of pressures. By way of further example, PSA-1 may be depressurized to 3 bar before it is purged and PSA-2 may be depressurized to 1.5 bar before it is purged. Alternatively, PSA-1 may be depressurized to 5 bar before it is purged and PSA-2 may be depressurized to 3 bar before it is purged. In still another alternative, PSA-1 may be depressurized to ambient pressure before it is purged and PSA-2 may be depressurized by use of a vacuum. The depressurizing blow down stream may, for example, last for 5 to 10 seconds. Depressurization direction is preferably concurrent to feed. The subsequent purge may, for example, last for 100 to 200 seconds. As described above, a steam purge (of PSA-2) may be followed by a subsequent N2 purge. In an alternative embodiment, one or both of PSA-1 and PSA-1 may have multiple adsorbent beds, where each bed sequentially goes through the same cycle. For example, when an adsorbent bed in PSA-1 satisfies a condition, such as the adsorbent bed becoming sufficiently saturated, the feed flow can be diverted to a second adsorbent bed. The first adsorbent bed can then be regenerated by having the adsorbed gases released. To allow for a continuous feed flow, a sufficient number of adsorbent beds can be used so that the first adsorbent bed is finished regenerating prior to at least one other adsorbent bed satisfying the condition for switching reactors. PSA-2 may have a similar configuration. FIG. 2 illustrates an embodiment utilizing a two stage PSA process wherein at least PSA-1 has multiple adsorbent beds, termed a shift reaction promotion section. Though not specifically delineated in any of the Figures herein, the purified CO2 output of the PSA process can be used in applications to recover oil, gas, or associated hydrocarbons from surface and/or subterranean deposits (e.g., conventional downhole oil/natural gas reservoirs, unconventional reservoirs/wells, shale oil deposits, shale gas deposits, tight gas sands, stranded gas deposits, fracking deposits, and the like). In many of these embodiments, relatively high CO2 purities may be desirable, e.g., to increase efficiency and reduce costs associated with compressing impurities. Nevertheless, in certain of these embodiments, at least some part of enhanced oil/gas/hydrocarbon recovery can efficiently utilize lower CO2 purities (e.g., from about 60% to about 85% or from about 60% to about 80%), and particularly can offer a distinct benefit from methods according to the invention that allow (increased) flexibility in CO2 stream purity (e.g., a staged flood, wherein a sequence of different purities are used). Such flexible purity control can be aligned with a particular deposit/reservoir that can age over time and/or with the quality of a particular deposit. In various aspects, a swing adsorption process can be performed to separate N2 from CO2 at a temperature and pressure beneficial for other aspects of the combined power generation process. For example, the recycled exhaust gas can have a temperature from about 300°C to about 600°C (e.g., from about 300°C to about 550°C, from about 300°C to about 500°C, from about 300°C to about 450°C, from about 300°C to about 400°C, from about 350°C to about 600°C, from about 350°C to about 550°C, from about 350°C to about 500°C, from about 350°C to about 450°C, from about 400°C to about 600°C, from about 400°C to about 550°C, from about 400°C to about 500°C, from about 425°C to about 600°C, from about 425°C to about 550°C, from about 425°C to about 500°C, from about 425°C to about 460°C, from about 450°C to about 600°C, from about 450°C to about 550°C, or from about 500°C to about 600°C; additionally or alternately, the temperature can be at least about 325°C, e.g., at least about 350°C, at least about 400°C, at least about 425°C, or at least about 440°C; further additionally or alternately, the temperature can be about 575°C or less, about 550°C or less, about 500°C or less, about 475°C or less, about 460°C or less, or about 440°C or less) and a pressure from about 10 bara (about 1.0 MPaa) to about 60 bara (about 6.0 MPaa) (e.g., a pressure of at least about 10 bara (about 1.0 MPaa), at least about 15 bara (about 1.5 MPaa), at least about 20 bara (about 2.0 MPaa), at least about 25 bara (about 2.5 MPaa), or at least about 30 bara (about 3.0 MPaa) and/or a pressure of about 60 bara (6.0 MPaa) or less, about 50 bara (about 5.0 MPaa) or less, about 40 bara (about 4.0 MPaa) or less, about 35 bara (about 3.5 MPaa) or less, about 30 bara (about 3.0 MPaa) or less, about 25 bara (about 2.5 MPaa) or less, or about 22.5 bara (about 2.25 MPaa) or less). As noted above, one goal of the separation process can be to perform the separation under conditions compatible with the power generation process. Thus, it can be desirable to perform the separation at approximately the temperature and pressure of the recycled exhaust gas. In order to accomplish a separation at the conditions of the recycled exhaust gas, the adsorbent material in a pressure swing adsorber reactor should generally be effective under such conditions. One example of a suitable adsorbent includes a mixed metal oxide adsorbent, such as an adsorbent including a mixture of an alkali metal carbonate and an alkaline earth metal oxide and/or a transition metal oxide. Examples of suitable alkali metal carbonates can include, but are not limited to, a carbonate of lithium, sodium, potassium, rubidium, cesium, or a combination thereof, e.g., a carbonate of lithium, sodium, potassium, or a combination thereof. Examples of suitable alkaline earth metal oxides can include, but are not limited to, oxides of magnesium, calcium, strontium, barium, or a combination thereof, e.g., oxides of magnesium and/or calcium. Some examples of suitable transition metal oxides can include, but are not limited to, oxides of lanthanide series metals, such as lanthanum, and/or of transition metals that can form oxides with the metal in a +2 or +3 oxidation state (such as yttrium, iron, zinc, nickel, vanadium, zirconium, cobalt, or a combination thereof). In some aspects, the carbonate can be selected independently from the oxide in the mixed metal oxide. In such aspects, the carbonate can include, consist essentially of, or be lithium carbonate, sodium carbonate, potassium carbonate, rubidium carbonate, and/or cesium carbonate (e.g., lithium carbonate, sodium carbonate, and/or potassium carbonate; lithium carbonate and/or potassium carbonate; lithium carbonate and/or sodium carbonate; or sodium carbonate and/or potassium carbonate). In aspects where the carbonate is selected independently from the oxide, the oxide can be an alkaline earth oxide, a transition metal oxide, a combination of two or more alkaline earth oxides, a combination of two or more transition metal oxides, or a combination of oxides including at least one alkaline earth oxide and at least one transition metal oxide. In aspects where the independently selected oxide includes one or more alkaline earth oxides, a suitable alkaline earth oxide can include, consist essentially of, or be magnesium oxide, calcium oxide, strontium oxide, and/or barium oxide, e.g., including at least magnesium oxide and/or calcium oxide. Additional materials can include hydrotalcites. Because PSA-1 may be purged with a portion of an enriched N2 stream as opposed to steam, additional adsorbent materials of high CO2 adsorption capacity may be used in PSA-1 which have not been previously considered for PSA processes due to their sensitivity to steam. High-capacity, steam-sensitive materials suitable for use in PSA-1 when purged with N2 are listed in TABLE I below. 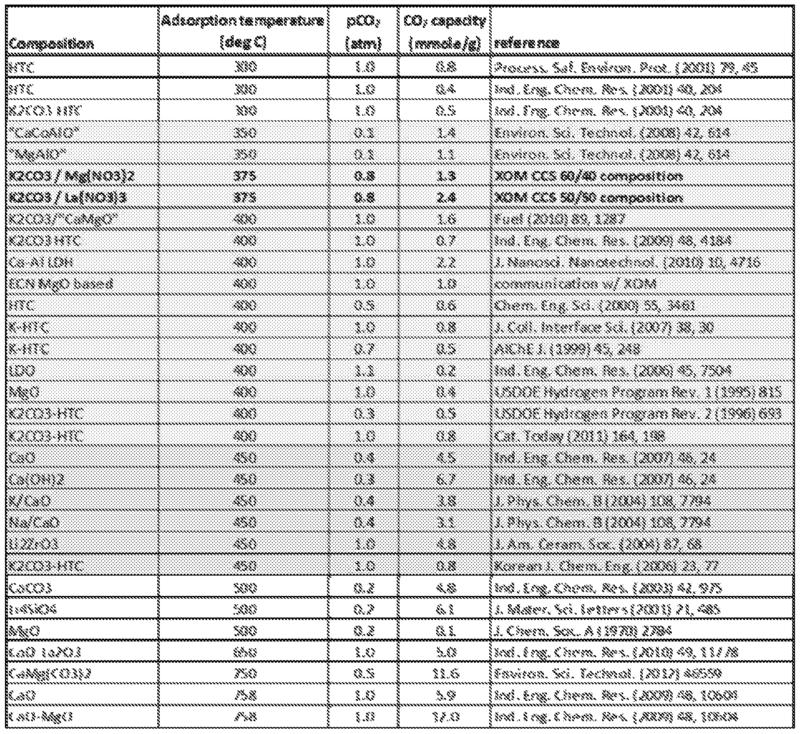 In particular, certain compositions listed in TABLE I exhibit exceptional CO2 adsorption capabilities not typically attainable by materials compatible with steam purges. For example: CaO demonstrates a CO2 adsorption capacity of 4.5 moles per kilogram at 0.4 atmospheres; Ca(OH)2 demonstrates a CO2 adsorption capacity of 6.7 moles per kilogram at 0.3 atmospheres; CaO-La203 demonstrates a CO2 adsorption capacity of 5.0 moles per kilogram at 1.0 atmosphere; and CaMg(C03)2 demonstrates a CO2 adsorption capacity of 1 1.6 moles per kilogram at 0.5 atmospheres. Additionally or alternately, the present invention can include one or more of the following embodiments. Embodiment 1. A method for generating power, comprising: compressing a recycled exhaust gas in a main compressor to generate a compressed recycle exhaust gas, the compressed recycle exhaust gas having a recycle temperature from about 400°C to about 500°C and a recycle pressure from about 10 bara (about 1.0 MPaa) to about 30 bara (about 3.0 MPaa), the recycled exhaust gas comprising at least about 70 vol% of N2 and at least about 10 vol% of CO2; compressing enriched air in an inlet compressor to generate a compressed oxidant; passing a first portion of the compressed recycle exhaust gas into a combustion chamber; stoichiometrically combusting the compressed oxidant and a fuel in a combustion chamber and in the presence of the first portion of the compressed recycle exhaust gas, thereby generating a discharge stream, wherein the first portion of the compressed recycle exhaust gas acts as a diluent configured to moderate the temperature of the discharge stream; expanding the discharge stream in an expander to at least partially drive the main compressor and generate the recycled exhaust gas; passing a second portion of the recycled exhaust gas into a first swing adsorption reactor comprising a first adsorbent material; adsorbing CO2 on the first adsorbent material; recovering a first N2 stream from a forward end of the first swing adsorption reactor; reducing the pressure in the first swing adsorption reactor by outputting a blow down stream from at least one end of the first swing adsorption reactor; purging the first swing adsorption reactor with a portion of the first N2 stream recovered from the first swing adsorption reactor to create a first purge output from the first swing adsorption reactor; passing the first purge output to a second swing adsorption reactor comprising a second adsorbent material; adsorbing CO2 on the second adsorbent material; recovering a second N2 stream from a forward end of the second swing adsorption reactor; reducing the pressure in the second swing adsorption reactor by outputting a blow down stream from at least one end of the second swing adsorption reactor; purging the second swing adsorption reactor with a steam purge. Embodiment 2. The method of embodiment 1, wherein the compressed oxidant has an oxygen concentration of between about 30 vol% and about 50 vol%, and optionally also wherein generating the compressed oxidant further comprises mixing the enriched air with atmospheric air. Embodiment 3. A method for production of N2 and CO2 from a reactor exhaust stream, comprising: passing a reactor exhaust stream comprising at least about 70 vol% N2 and at least about 10 vol% CO2 into a first swing adsorption reactor comprising a first adsorbent material; adsorbing CO2 on the first adsorbent material; recovering a first N2 stream from a forward end of the first swing adsorption reactor; reducing the pressure in the first swing adsorption reactor by outputting a blow down stream from at least one end of the first swing adsorption reactor; purging the first swing adsorption reactor with a portion of the first N2 stream recovered from the first swing adsorption reactor to create a first purge output from the first swing adsorption reactor; passing the first purge output to a second swing adsorption reactor comprising a second adsorbent material; adsorbing CO2 on the second adsorbent material; recovering a second N2 stream from a forward end of the second swing adsorption reactor; reducing the pressure in the second swing adsorption reactor by outputting a blow down stream from at least one end of the second swing adsorption reactor; purging the second swing adsorption reactor with a steam purge. Embodiment 4. A method according to any one of the previous embodiments, further comprising passing a second purge stream through the second swing adsorption reactor to generate a second CO2 recovery stream, the second purge stream having a different composition than the steam purge. Embodiment 5. A method according to any one of the previous embodiments, wherein the passing, the adsorbing, the recovering, the reducing, and the purging comprise a pressure swing adsorption cycle, the second portion of the recycled exhaust gas and the purges, when present, comprising at least about 95 vol% of gases introduced into either of the swing adsorption reactors during the pressure swing adsorption cycle. Embodiment 6. A method according to any one of the previous embodiments, further comprising separating the CO2 recovery stream into a CO2 product stream and water, the CO2 product stream containing at least 90 vol% of CO2. Embodiment 7. A method according to any one of the previous embodiments, wherein the recycled exhaust gas has a CO2 concentration of between about 5 vol% and about 20 vol% (e.g., between about 10 vol% and about 20 vol%) and/or an 02 concentration of about 1 vol% or less. Embodiment 8. A method according to any one of the previous embodiments, wherein the adsorbent of the second pressure swing adsorbent reactor comprises one or more of the following: (a) an alkali metal carbonate (such as potassium carbonate, lithium carbonate, and/or sodium carbonate) and an oxide of an alkaline earth metal and/or a transition metal (such as one that forms the oxide in a +2 and/or +3 oxidation state), e.g., comprises at least one of lithium carbonate or potassium carbonate and at least one of lanthanum oxide, yttrium oxide, and magnesium oxide; (b) an alkaline earth metal carbonate (such as magnesium carbonate and/or calcium carbonate) and an oxide of a transition metal (such as one that forms the oxide in a +2 and/or +3 oxidation state), e.g., comprises at least one of magnesium carbonate or calcium carbonate and at least one of lanthanum oxide, yttrium oxide, and magnesium oxide; and (c) a hydrotalcite. Embodiment 9. A method according to any one of the previous embodiments, wherein the temperature of the recovered N2 stream from the first pressure swing adsorption reactor is at least the adsorption temperature. Embodiment 10. A method according to any one of the previous embodiments, wherein reducing the pressure in either of the swing adsorption reactors comprises (i) outputting a first blow down stream from the forward end of either reactor and/or (ii) outputting a second blow down stream from the forward end of either reactor and a third blow down stream from a back end of either reactor after outputting the first blow down stream. FIG. 6 shows how the recovery (represented as a molar ratio) and purity (represented as a percent) trade off against steam usage for exemplary PSA configurations that can further illustrate the invention. For each of the cases shown, the feed composition and pressure are similar to those described in the examples above. In FIG. 6, either ~3-bed or ~4-bed PSA configurations are illustrated for typical adsorbent properties of mass transfer and adsorbent capacity. As seen in FIG. 6, higher purity CO2 (> 95 vol%) can be achievable with increased steam usage, but still less than -1.0 mol/mol of CO2 recovered. In addition, the use of ~4 adsorption beds can allow a reduced pressure swing via the use of a higher relative purge pressure (> about 1.35-1.5 bara, typically from ~2 bara to ~3 bara), which can reduce both equipment and energy requirements for subsequent CO2 compression prior to use in EOR facilities. Further improvement of the ~4-vessel recoveries shown in FIG. 6 can be obtained using configurations where the vessels are in fluid communication with each other. FIG. 7 shows a 3-bed configuration that is illustrative but not limiting of one possible arrangement of adsorbent beds within the scope of the invention. In this configuration, one bed is on feed and producing nitrogen product at all times. The other two beds can be undergoing other steps of the cycle, e.g., that regenerate the adsorbent, whilst the first bed is making product at relatively high pressure. In this particular 3-bed arrangement, there is no fluid connection (i.e., exchange of gas streams) between the beds, which reduces cycle complexity as well as equipment such as interconnecting piping and valving. FIG. 2, as discussed above, illustrates a configuration of PSA reactors for a two stage PSA process. As shown in FIG. 2, the two stage PSA process may be operated with the recycled exhaust gas passed to PSA-1 at a pressure of 21 bar. The recycled exhaust gas may have a CO2 concentration of 3% to 5%. A stream of enriched N2 may be recovered from PSA-1 at the same pressure as that of the recycled exhaust gas. PSA-1 then undergoes a blow down process that may decrease the pressure of PSA-1 to an intermediate pressure of 12 bar, 5 bar, 3 bar, or 1 bar. A portion of the N2 stream is directed to PSA-1 for purging and as a result, gas with an 11% CO2 concentration may be expelled from PSA-1. That gas is then redirected to PSA-2. A stream of N2, which may also contain O2, is recovered from PSA-2. PSA-2 is then purged with steam at a pressure lower than the intermediate pressure. The two stage PSA process may alternatively be operated with the recycled exhaust gas passed to PSA-1 at a pressure of 30 bar. The recycled exhaust gas may have a CO2 concentration of 7%. A stream of enriched N2 may be recovered from PSA-1 at the same pressure as that of the recycled exhaust gas. PSA-1 then undergoes a blow down process that may decrease the pressure of PSA-1 to an intermediate pressure of 12 bar. A portion of the N2 stream is directed to PSA-1 for purging and as a result, gas with a 14.5% CO2 concentration may be expelled from PSA-1 at 12 bar. That gas is then redirected to PSA-2. A stream of N2, which may also contain O2, is recovered from PSA-2. PSA-2 may then be purged with steam at 1.8 bar. A stream of CO2 and steam may be recovered from PSA-2 at 1.7 bar. The embodiments and examples described herein are merely illustrative, as numerous other embodiments may be implemented without departing from the spirit and scope of the exemplary embodiments of the present application. Moreover, while certain features of the application may be shown on only certain embodiments or configurations, these features may be exchanged, added, and removed from and between the various embodiments or configurations while remaining within the scope of the application. Likewise, methods described and disclosed may also be performed in various sequences, with some or all of the disclosed steps being performed in a different order than described while still remaining within the spirit and scope of the present application. purging the second swing adsorption reactor with a steam purge. 2. The method of claim 1, wherein the compressed oxidant has an oxygen concentration of between about 30 vol% and about 50 vol%, and optionally also wherein generating the compressed oxidant further comprises mixing the enriched air with atmospheric air. 4. A method according to any one of the previous claims, further comprising passing a second purge stream through the second swing adsorption reactor to generate a second CO2 recovery stream, the second purge stream having a different composition than the steam purge. 5. A method according to any one of the previous claims, wherein the passing, the adsorbing, the recovering, the reducing, and the purging comprise a pressure swing adsorption cycle, the second portion of the recycled exhaust gas and the purges, when present, comprising at least about 95 vol% of gases introduced into either of the swing adsorption reactors during the pressure swing adsorption cycle. 6. A method according to any one of the previous claims, further comprising separating the CO2 recovery stream into a CO2 product stream and water, the CO2 product stream containing at least 90 vol% of C02. 7. A method according to any one of the previous claims, wherein the recycled exhaust gas has a CO2 concentration of between about 5 vol% and about 20 vol% (e.g., between about 10 vol% and about 20 vol%) and/or an 02 concentration of about 1 vol% or less. 9. A method according to any one of the previous claims, wherein the temperature of the recovered N2 stream from the first pressure swing adsorption reactor is at least the adsorption temperature. 10. A method according to any one of the previous claims, wherein reducing the pressure in either of the swing adsorption reactors comprises (i) outputting a first blow down stream from the forward end of either reactor and/or (ii) outputting a second blow down stream from the forward end of either reactor and a third blow down stream from a back end of either reactor after outputting the first blow down stream. ES2346627B1 (en) 2009-04-17 2011-08-08 Consejo Superior De Investigaciones Cientificas (Csic) Use of a microporous crystalline zeolite material conestructura rho treatment of natural gas. IT1397523B1 (en) 2009-12-21 2013-01-16 Ansaldo Fuel Cells Spa System and method for separating CO2 from combustion gases by means of mcfc stacks multi-stack.